A plate of delicious macadamia nuts in Hawaii. Ever had a close friend bring you back chocolate-covered macadamia nuts from Hawaii? They are among the most popular treats and gifts to bring back home. This is because macadamia nuts are some of the tastiest products you can find in Hawaii. Whether sprinkled in cookies or glazed in chocolates, most people associate them with candies. However, most are unaware that macadamia nuts actually have unique properties and health benefits. We’ll tell you more about macadamia nuts in Hawaii and why the State is among the world’s leading producers. The macadamia tree is not indigenous to Hawaii. It originated from Australia. William H. Purvis planted the tree bearing the first macadamia nuts in Hawaii at the end of the 19th century. Hawaii popularize the nut and established the industry. 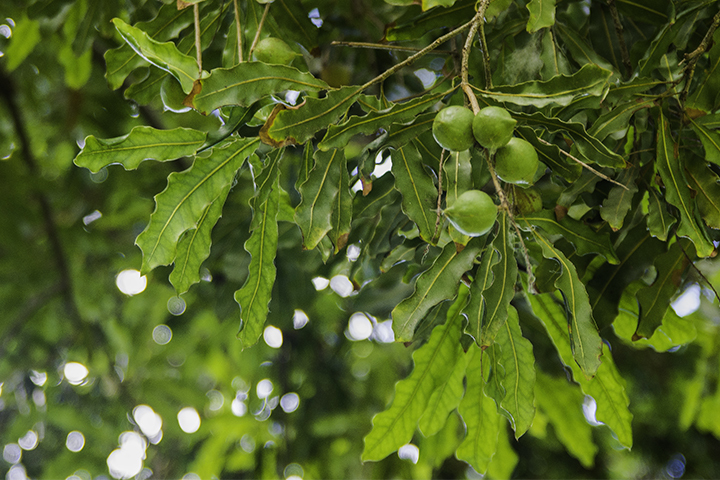 Farmers in Hawaii grow macadamia nut trees under strict regulations to ensure their quality. The Hawaii Macadamia Nut Association helps Hawaii farmers in this process. It does this by helping to expand the industry and by supporting high-quality production in the State. The word “macadamia” comes from Dr. John MacAdam, a Scottish chemist, who settled in Australia. His botanist friend, Baron Ferdinand Heinrich von Mueller, identified the tree. And then he named it “macadamia” in John MacAdam’s honor. People recognize Hawaiian macadamia nuts for it freshness. This is because planters in Hawaii harvest them year round. The Big Island produces most of the macadamia nuts in Hawaii. In 2005 to 2006 alone, the island grew over 60 million pounds of macadamia nuts. Because macadamia nuts have no gluten in them, they are often uses in gluten-free flours and recipes. Ground macadamia has a smooth consistency and a rich flavor. As a result, it’s a popular substitute for wheat-based flours. There are roughly seven species of macadamia nuts. But planters can only cultivate two kinds, since not every species produces edible nuts. Macadamia nuts are mineral-rich with calcium, copper, chromium, iron, magnesium, selenium and zinc. The nuts are also loaded with fiber, protein, vitamin-B and antioxidants. The macadamia nut’s fat content is nearly 83% monosaturated fatty acid which helps to increase cardiovascular strength. A Pennsylvania State University study found that macadamia nuts improved peoples’ blood lipid profiles and cholesterol. 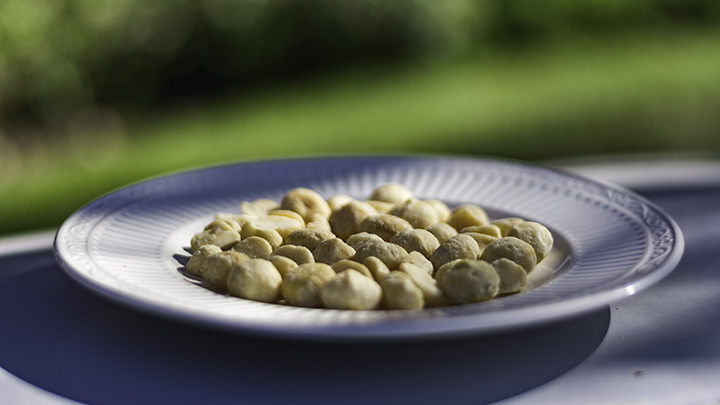 While macadamia nuts have notable health benefits, because of the high fat content, portion control is highly advisable. The nuts carry over 700 calories per 100 grams. Though chocolate-covered macadamia nuts might be the most popular, many companies produce a wide variety of products. Some dip them in white milk or dark chocolate. Others mix them into decadent truffles. While another may season them in sea salt, spices, chives, onion, garlic or even glaze them with honey. Whether you prefer sweet or savory treats, you are certain to find Hawaiian macadamia nuts to suit your taste. This company is famous for packaging over 15 million boxes of Hawaiian Host candies per year. Thus, making it the largest chocolate-covered macadamia nut producer in the world. They market over 250 products and offer tours of its chocolate factory. This is another of the Big Island’s farms that grow their produce on the volcanic slopes of Mauna Kea. They are known for authentic Kona coffee and fresh macadamia nuts seasoned in many flavors. You can find this company in Waimea. It offers a wide range of macadamia candies and seasoned nuts imaginable. But it also offers macadamia nut pancakes, cooking oils, macadamia nut butter and rum cakes. This is a great place for families to visit. Because while here, you can sample even spam-flavored macadamia nuts. Located south of Hilo, it has a nearly 2,500-acre orchard, a nut processing facility and a chocolate factory. Here, tourists can enjoy tasting the nuts or visit the guest center. Also, those who like self-guided tours can venture down its Great Hawaiian Mac Nut Trail. The trail feature large macadamia nut farms, family-run shops and sampling spots. This company has been producing award-winning macadamia nut products since 1986. From its macadamia nut caramel corn to chocolate-dipped nuts, Island Princess arranges beautifully themes gift baskets and limitless options of flavored nuts. They have offer some of largest product varieties on the market, making their store in Honolulu a worthwhile stop before flying back home.. This is a laid back macadamia homestead on 5-acre lot that has been operating since the 1980’s. The farm welcomes visitors who want to crack nuts open or savor fresh macadamia nuts. Additionally, you can take a tour and even enjoy conversations with the farm owners, Tuddie and Kammy Purdy. Whatever island you find yourself on, do not leave Hawaii without trying some of Hawaii’s delectable macadamia nuts.